Using AND, OR, and NOT to connect your search terms together will help you find exactly what you're looking for. These words, known as Boolean operators, tell a database how you want your search terms to relate to each other. Once you understand how AND, OR, and NOT impact your search, be sure to continue to the next tab of this guide. make your search smaller so you get fewer results. tell the database that ALL search terms must be present in the results. 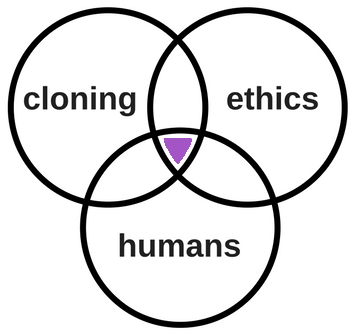 Example: cloning AND humans AND ethics. 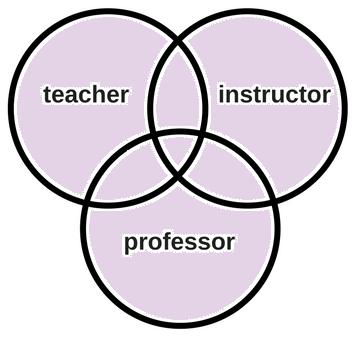 In the image below, the center of the Venn diagram where the 3 circles overlap (shaded in light purple) represents the results for this search. All results would contain the words cloning, ethics, and humans. Many library databases automatically search with AND between search terms unless you specify otherwise -- just like Google. connect two or more similar concepts (synonyms). tell the database that ANY of your search terms can be present in the results -- even if it's just one of them. Example: teacher OR instructor OR professor. As demonstrated in the image below, your results could come from any of the circles in the Venn diagram. Each result will contain one or more of your terms: teacher, instructor, or professor. tell the database to exclude unwanted words that may otherwise come up in your search. make your search smaller so you get fewer, more focused results. 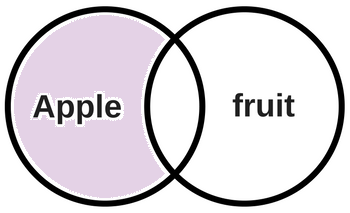 Example: Apple NOT fruit (if trying to find information on the company rather than the fruit). As demonstrated in the Venn diagram below, your results would include only the part of the Apple circle that does not overlap with the fruit circle. Beware! Using NOT can exclude potentially useful results so use it carefully. If you're having trouble, ask a librarian. This work by the Consortium Library is licensed under a Creative Commons Attribution 4.0 International License and is based on MIT Libraries' Database Search Tips (CC-BY-NC). Note that linked content is covered by its own licenses.